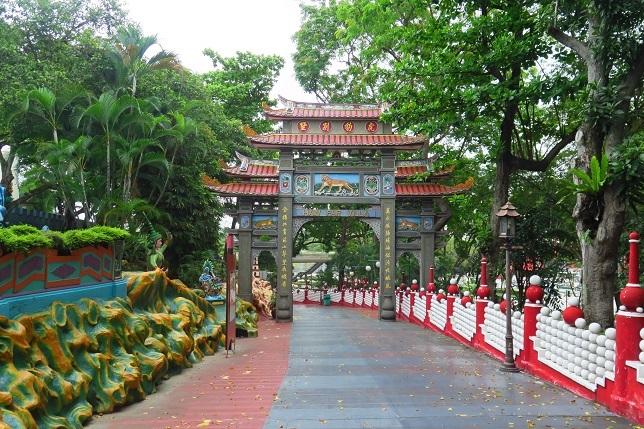 Haw Par Villa is located on a hill side in Pasir Panjang. It originally comprised a villa designed by architect Ho Kwang Yew and a large garden space. The compound was a gift from Mr Aw Boon Haw to his younger brother Mr Aw Boon Par. They were rich businessmen who built their fortune on the famous Tiger Balm ointment that is still popular today. During World War II, the compound suffered extensive damages but the garden survived. Boon Haw rebuilt the garden with custom made statues featuring Chinese culture and virtues. Notable statuaries that were added to the garden included the “Courts of Hell” and “Journey to the West”. In 1954, following the death of Boon Haw, the garden was passed to his nephew Mr Aw Cheng Chye who added the “International Corners” to the garden. These corners represented the different countries he had visited. The government took over the garden in 1985 and it was developed into the “Haw Par Villa Dragon World” theme park in 1990. In 2001, the theme park ceased operations and the grounds were converted into a public park.